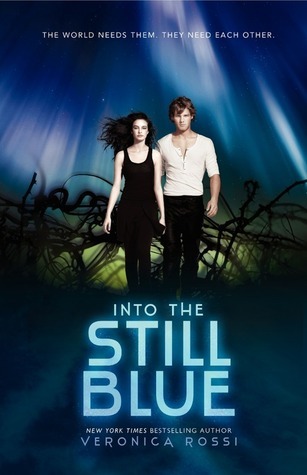 Perry and Aria have to figure out a way to save the Dwellers and the rest of Perry’s tribe by bringing them into the Still Blue. However, now that Sable and Hess have teamed up, it seems almost impossible that Aria and Perry will be able to save their people. First, they must rescue Cinder, because he is the only one that can help them get to the Still Blue, even though it means sacrificing himself to save them all. I really enjoyed this series overall. Aria and Perry have grown so much since the first book, both individually and as a couple. They finally have learned how they best complement each other, and that they cannot stop the other from fighting alongside them. Their relationship allows them to help the Dwellers and the Outsiders see past their differences and help each other to survive. One of my favorite things about this series is Roar and Aria’s relationship. This was so well done by Rossi–Aria and Roar are able to have a very close friendship without it being at all romantic or love triangle-y. The two of them have a great relationship and after the loss of Liv it is even more important that Roar have someone like Aria by his side. The ending to this series was somewhat predictable, but I like the way it was executed. Once again, the dual narration worked well, especially towards the end. I really loved how strong Aria has become, especially outside of her home, and how she has truly become part of both the Dwellers and the Outsiders. Overall, Into the Still Blue was a great ending to the series! I’m sad that this series had to end, and while the ending was somewhat predictable, I enjoyed the way it was done. Into the Still Blue was released on January 28, 2014. Aria has spent her whole life in a city inside a dome called Reverie. People are unable to survive outside the dome because of the Aether, energy that has filled the sky and created a wasteland. When Aria’s mother goes missing, she decides to do everything that she can to find her. When she begins to become a problem, she is taken outside of the dome and left to die. However, she is saved by an outsider named Perry, who is trying to rescue his nephew Talon. He suspects that Aria may be able to help him find Talon, so he agrees to help her find answers about her mother. I have been meaning to read this book for the longest time and I’m glad that I finally was able to. Under the Never Sky is told in dual perspectives, alternating back and forth between Aria and Perry. Usually this type of narrative annoys me but in this book it worked because it allowed the reader to understand what both Aria and Perry were going through and how their situation affected each of them differently. Aria starts out being scared and unable to survive on her own but she is determined to do whatever she has to in order to find her mother, even if it means walking for miles with bleeding feet. Perry, at first, is annoyed with having to help her and how little she knows about surviving outside of the dome and he would rather be on his own. Throughout the book, however, they both undergo an amazing transformation and begin to understand what the other is going through. Aria learns how to survive and defend herself and Perry realizes that having feelings and caring for someone does not make him weak. One of my favorite things about this book was that Aria was a talented singer. Her mother would have her sing arias for her in the Realms, which is sort of like a virtual reality that people in Reverie use to interact. As someone who also sings, I was able to relate to the feeling Aria had whenever she sang for people. I also really loved the way that the Aether caused people living outside the domes to develop enhanced senses. Some people could hear sounds that were miles away while others could see things from extreme distances. Perry’s enhanced ability of smell was very interesting also; he could tell who was near him just by their scent. Overall, Under the Never Sky was an exciting read with great characters, romance, and even some science fiction elements. It was fantastic from start to finish and I can’t wait to see what happens next! 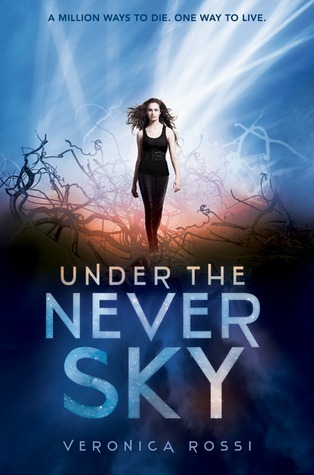 Under the Never Sky was released January 3, 2012 and is the first book in a series. 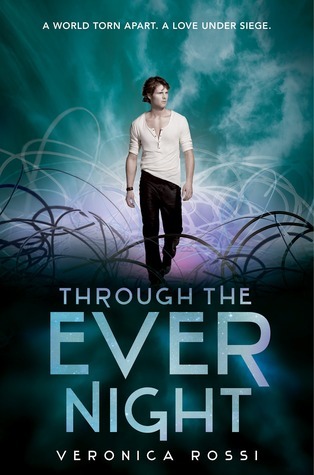 The second book, Through the Ever Night, was released yesterday, January 8, 2013 so you can guess what I’m reading now!! 2013 is definitely going to start off with a bang for YA lit! I am declaring 2013 The Year of Sequels because nearly every book that I am eagerly anticipating for next year is a sequel to something I read in 2012, The Year of Debuts. I had hoped that next year I would finally be able to start reading the 60 or so books that I own but have yet to read but upon seeing the multitude of upcoming releases for 2013 I think this will be almost impossible. There are simply too many books being released that I absolutely MUST read first!! I literally just started reading Under the Never Sky and even though I’m only about thirty pages in, I’m already hooked! I waited much longer than most to read this book but the good news is that I have less time to wait before the sequel is released! The even better news is that it is released the same day I am leaving for vacation, so I now have the perfect book to read on the airplane! This is the final book in the Across the Universe trilogy and I cannot even begin to say how excited I am to read this! Across the Universe was a stunning book about a space station in the middle of the universe and its sequel, A Million Suns was even better. I can’t wait to read the conclusion to Elder and Amy’s story! I’ve been a follower of Lenore’s blog for awhile now and I am very excited that her book has been published! Level 2 is the first book in The Memory Chronicles and is a story about a girl in the afterlife who spends her time reliving her memories from Earth. When she discovers that there might be a way to return to her old life and the boy she loves, she finds herself stuck in the middle of a rebellion. This sounds like a really interesting story and I can’t wait to read it! Incarnate was one of my all time favorite books of 2012 and one of the most original stories I’ve ever read. The whole concept of reincarnation over and over again was fascinating and I can’t wait to see how Ana’s story continues. Legend has been on my to read list for a very long time and I have heard a lot of great things about both Legend and its sequel, Prodigy. The series is a dystopian featuring a strong female protagonist, so I’m sure I will love it. I will definitely have to read both very soon! This book is the sequel to The Hunt, which is another one of my favorites from 2012. The Hunt was a completely different take on vampires and even though I thought I was over the whole vampire craze, I absolutely LOVED it. I can’t wait to see what happens next in The Prey. So it looks like a very exciting start to 2013! What releases are you looking forward to in the new year?